When summer arrives and everyone else is slacking off, you can show them who’s boss with this awesome mix of workouts. During summertime, we all know how days come and go, trips pop up here or there, and most of the time you don’t know whether you’re coming or going. And many of us forget about exercise and pack on a few pounds. But certainly not you. The Summer Maintenance plan gives you a delightful variety of 12 workouts for you to move around your calendar to suit your summer schedule and stay in tip top shape. Stuck in a hotel without a gym? We’ve got you covered. Only have 20 minutes to train? We’ve got you covered. Feel like you need to spontaneously train your abs at 3 in the morning? We’ve got you covered. Stranded in shark infested waters off the coast of Madagascar? We have limits, but give us time and we’ll create a plan for that situation. In the meantime, use this opportunity to work on your breaststroke. Every workout included in this plan provides different challenges dedicated towards achieving different goals. 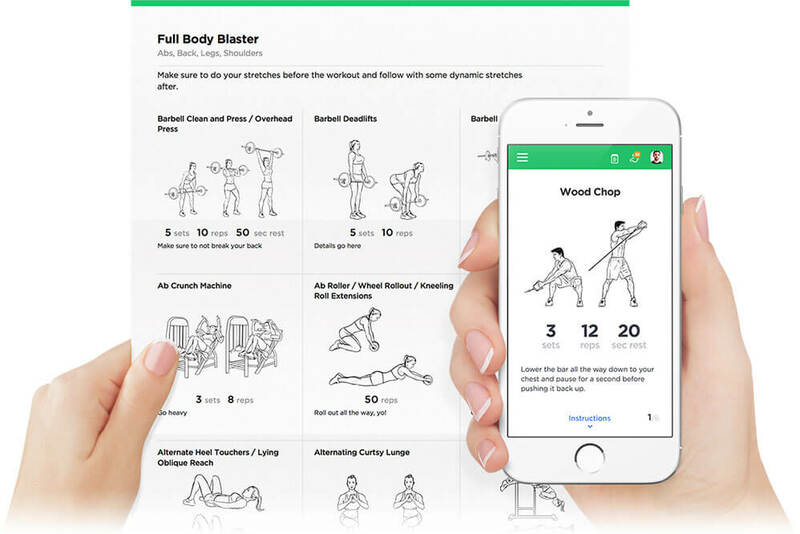 In the instructions below you can learn more about each individual workout routine, its objectives and how it can be modified to either be more or less challenging. The Summer Maintenance plan is built up of 12 individual workouts that pick and choose to suit your daily goals and current situation. Read up on each workout below so you know which you’d like to tackle when. – The Run-Jump-Run-Push Fitness Test is a great way to start. Designed to test both your cardio fitness as well as your upper and lower body endurance. This test must be completed as fast as you can. Start your timer, work through each exercise resting whenever you feel necessary, and then stop the timer once the test is complete. Take note of this time and compare it with future attempts! To make this workout more challenging simply take less rest! Are you able to go through the whole thing without stopping? That is your goal! Less challenging: relax! You don’t have to run during the entire 1-mile distances. Run a few hundred yards, then walk for a minute or two, and then run again! The squat jumps can be modified to standard body-weight squats (without the jumps) and the push ups can be modified by simply placing your knees on the floor. – The ‘Anywhere’ 30-Minute Tabata Workouts (Upper and Lower) are perfect for getting in a quick sweat, especially if you don’t have a lot of space to work with. The style, Tabata, is easier to understand than to perform: work for 20 seconds, rest for 10 seconds, repeat x 8. Each exercise lasts a mere 4 minutes, but OUCH, you’ll be on fire in all the right ways. More challenging: if that really appeals to you, boost the working time. Go for 25 - 30 seconds of work and only 10 seconds of rest. You machine. Less challenging: simply increase the resting time. Admittedly, when testing this workout in the WorkoutLabs office some of us (not mentioning names…) had to increase the resting time by an extra 5 seconds, which is more than okay! Start out with 20 seconds of work, 20 seconds of rest and gradually bring your rest down to the official Tabata style. – The 30-Minute HIIT Workouts (Upper and Lower) are similar to the ‘Anywhere’ Tabata workouts in a sense that they can be performed anywhere with little to no equipment! If your goal is to burn Calories, the 30-Minute HIIT workouts are a great choice. The work/rest ratio is 2:1, meaning you’ll rest for half the amount of time that you work. Both workouts finish with a mini ab routine (which can be cut to save time) to complete each workout nicely. More challenging: why not change up the ratios a little? Go for a 3:1 work/rest ratio for an ultimate fat-burn workout! Less challenging: make the ratios a little bit friendlier. A great start would be a 1:1 work/rest ratio. Once you feel comfortable, start aiming for more challenging ratios! More challenging: aim to increase the weight used on the resistance exercises. Steadily progress every week - with more weight, comes stronger muscles! Less challenging: reduce the weight and start out with pure form focus. Once you feel confident with each exercise, lightly increase the weight week by week. 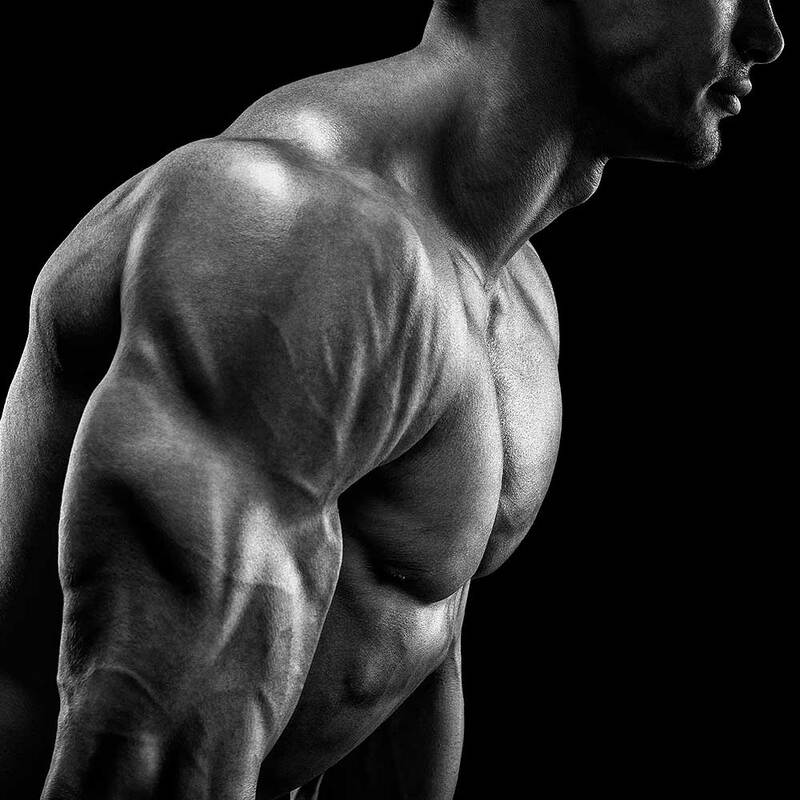 If necessary, increase the resting time to allow those muscles to fully recover before hitting your next set. – The Cardio Blitz Workout is your way to say goodbye to last night’s cheesecake. The great thing about this workout is that your heart rate never has a chance to stay in the same zone. By keeping your heart rate on its toes (that barely makes sense), you’ll encourage all kinds of crazy fat burn! You can expect to burn up to 500 Calories in this 30-minute workout, just make sure you give it your all! More challenging: aim to increase the distance you cover over your previous record! Take no rests, and even attempt to run on an incline! Less challenging: take it slow! There is no need to rush into things right at the beginning. Walk for sections of the workout, row on a lower resistance, and gradually build up to something that works best for you! 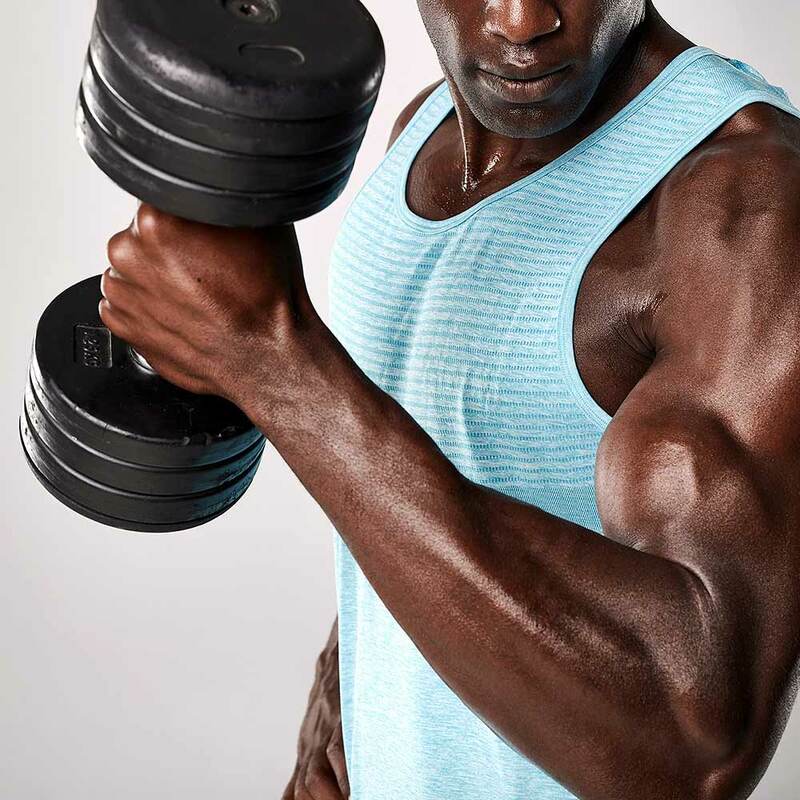 – The Dumbbells Only Workout will challenge your entire body in all new ways. This workout is designed to hit every muscle group using only a pair of dumbbells. Your best bet here is to change the weight of the dumbbells for each exercise. Take time to find a weight that challenges you, yet allows you to complete the specified reps. Key points to remember during this workout: - Hit all rep amounts, if you are unable to reach the rep amounts given, the weight is too heavy. - Do your absolute best not to over rest. We want you to build up a sweat and the rest times given are perfect for that! More challenging: increase the weights! If you feel as if you’re hitting the specified rep amounts with a little more juice in your tank, add a little bit of resistance and try again until your find your new challenge! Less challenging: focus on your form and use less resistance. Number one is control and form, once you have this nailed, increase the weight a little with every new attempt of this workout! – The Push-up Power Building Workout is designed to have you perfecting the push up! Make it a personal challenge to complete 10 full push ups by the end of summer (in a row!). Be sure to keep your core engaged throughout each exercise! This way you’ll prevent your back from ‘sagging’ towards the floor. Keep your back straight and chin up, you’ve got this! More challenging: aim to explode! Explosive strength is what push ups are all about! Specifically with the wall and floor push ups, aim to push away from the surface! Less challenging: your knees are your friends! Allow them to rest on the floor with each difficult exercise. They will support you while you build your upper body strength! – The Abs, Abs, & Abs At-Home Routine will work exactly what it mentions (too many times) in the title. We felt the need to mention abs numerously because this workout trains your abdominal muscles to all new kinds of levels. Three supersets of six exercises must be performed back to back giving you a brand new core developing challenge. Just when you thought your abs couldn’t take it anymore, we’ve thrown in a 3-minute crunch challenge at the end to fully exhaust your newly developing abs. Don’t worry, they’ll grow back bigger and stronger. More challenging: it’s all about reps! Add reps to each exercise; 5 here, 10 there. Before you know it, you’ll be feeling solid abdominal exhaustion. Don’t worry, washboard abs will keep you energized. Less challenging: take mini rests between sets or even during exercises. Once you feel as if you’ve worked your abs enough, take a little rest. You’ll gradually build the strength to go through each exercise without any issues. – The Glutes, Glutes, & Glutes At-Home Routine is similar to the Abs routine in the sense that it is mostly build up of supersets! Complete each superset back to back only resting once both exercises in the superset have been completed. To finish out this glute-boosting workout, we’ve included a glute circuit right at the end just to get that extra ‘oomph!’. Be sure to go through the circuit 3 times in total, only take a rest at the end of each circuit! More challenging: again add reps! Reps can make any workout more of a challenge, use them to your advantage. Feel like you’re hitting 15 reps with ease? Go for 20 instead! Less challenging: extend your resting time, or reduce the reps by 2 - 4 per exercise. You have to start somewhere you’re comfortable, and then gradually build yourself up!